Whilst Kirkwood has records dating back to an illustrious period in the 1870s and 1880s there was a hundred year gap in play at Kirkwood. The current pitch was (re)built in 2009. The field beside Dalton Village which was thought to have been the cricket pitch had turnips growing in it in 2005 and barley in 2006, then grass for sheep. In 2009 we started mowing and rolling and played the first two games at the end of 2009 season and only a few games were played in 2010. Prior to 2009, for 40 years, village cricket in Annandale had been played at Kinmount and Castle Milk. For over 20 years Anthony Steel was the main/sole organiser of the Kinmount Club, who just played on Sundays, all friendlies. When the owners of both these pitches declared that for understandable personal reasons they wanted to minimise the amount of games, Anthony felt it was an opportune time to recreate the pitch at Kirkwood. 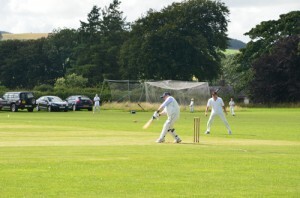 If Kinmount and Castle Milk pitches were to fall by the wayside then Kirkwood will be the only pitch in Annandale and there are only four other cricket pitches in the whole of Dumfries and Galloway – Nunholm (Dumfries CC), Kingholm (St Michaels CC), Langholm (Langholm CC), and Gatehouse (Galloway CC). The Kirkwood pitch was created in 2009 with no Government grants, no assistance from Cricket authorities (not that any was requested), nor public money of any kind, just hard work mowing and rolling. It is still used for grazing Kirkwood sheep in the Winter. In 2011 the Club played more often. Eight games were arranged on Sundays but 4 were rained off. A mid week team was started named “Dalton.” as that’s the Village beside the pitch, Kirkwood being a farm/estate. The different name helps because some of Kirkwood’s Sunday squad already played for different mid week teams and didnt want to play against Kirkwood. In 2012 again just friendlies were played on Sundays and again rain affected most of them! 5 games were completed. The mid week team had a great season though, defeating all other mid week opponents and winning the treble of league, knock-out cup and end of season tournament. Similarly in 2013 the mid week team were again all conquering, winning the league and the cup – although no end of season tournament was played. Also in 2013 for the first time the club entered the Cricketer’s National Village Cup which plays on Sundays. Additionally only 5 Sunday friendlies were managed, partly because of rain, partly because the Village Cup occupied 3 Sundays early in the season. 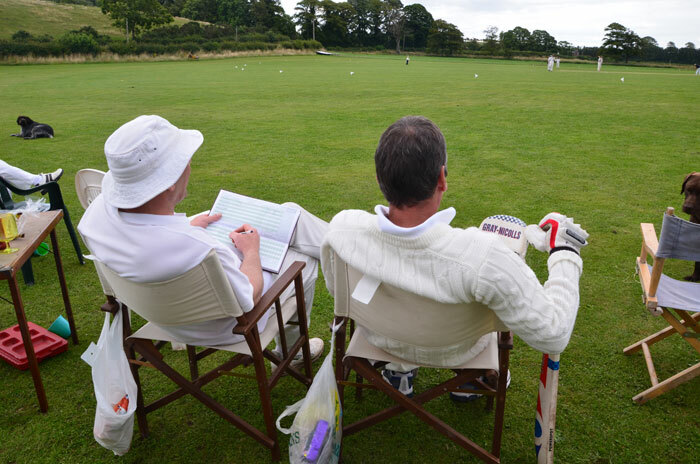 In the Village Cup Kirkwood beat Falkland CC and Meigle CC to win the Scottish section – an amazing achievement – but were soundly beaten by the Yorkshire champions Sessay. All games were played away which meant a lot of travelling. Since 2010 Kirkwood have also played an annual 2 day “Test Match” – 2 innings each based on time – against Breadalbane CC of Perthshire at the end of each season. Kirkwood show no mercy to their Highland guests and have yet to lose, but Breadalbane hang on for a draw occasionally! Back in the Nineteenth Century the cricket played at Kirkwood was extraordinary and unique. Again it was village cricket with the earliest recorded game versus Lockerbie in 1874 but Kirkwood boasted the England captain (of 1886) as a player and he had six brothers(!) three more of whom played first class cricket for Lancashire, Cambridge University and Scotland. This family of 7 Steels lived at Kirkwood, and so occasionally all played together for Kirkwood, although more often only a few of them were available. They also played in a more serious team named “Annandale Borderers” at Kirkwood. AG Steel not only captained All England in 1886 to the British team’s only ever whitewash of Australia, but he had played in the 1880 Test at the Oval – the first on British soil – then he played in the 2nd test (1882) at which the All England team lost and the RIP notice mentioning “Ashes” was published in the papers. Co-incidentally AG Steel had helped organise a team that was just about to depart for Australia in September 1882 so he and his team mates were charged by the British media to “recover our Ashes”. This they duly did – AG Steel topping both batting and bowling averages on that tour of 1882/83 – and the name Steel is on the little red urn that was presented to the tourists as a joke trophy. Back in Britain the next year (1884) AG Steel was the first to score a Test Century at Lords so his name heads the Lords Honours board. He was president of the MCC in 1902. The Steel brothers hold another record because no first class game Worldwide has ever boasted 5 brothers in the same team and yet 4 Steels played together versus Surrey in 1884. Kirkwood was their family home. Kirkwood CC aims to encourage village cricket. That means giving opportunities to players of all levels, abilities, ages etc. 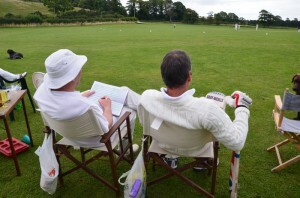 Kirkwood CC means to play in a responsible way, often in friendlies. In the competitions Kirkwood aims to be fiercely competitive on the pitch while relaxed off the pitch before and afterwards. It means to enjoy the social side, especially the teas and a beer after a game if possible. The Kirkwood motto is “Prudentia et Animo” – wisdom and spirit. For the Kirkwood club to thrive we wish to continue a mix between friendlies and competitions and we have no plans to enter any Saturday leagues partly because many of our cricketers play for big league “clubs” on Saturdays. They choose to play village cricket for Kirkwood on Sundays, and some even choose to play mid week cricket for Dalton too. As long as Kirkwood does not compete with the league clubs, these clubs should not feel threatened and they help us while we help them as a “feeder” by encouraging new players we find to play for these bigger club on Saturdays.